Glaucous sedge is a creeping perennial about 10 to 40cm tall. It has an upper spike of female flowers and two male spikes lower down the stem. The purplish-brown flowers are present throughout May and June and are followed by reddish black seeds. The name glaucous referees to the bluish-grey blush found on the underside of the leaves. Glaucous sedge is a native perennial of relatively nutrient poor, un-shaded grassland and can be found on a wide range of soils including chalk, limestone, clays and sands on pHs that are calcareous, neutral or even slightly acidic. It can also be found in both damp and dry conditions and is even salt tolerant being found in the uppermost parts of saltmarshes. Having said that it is likely that populations of glaucous sedge have adapted through means of natural selection to exploit these different habitats so, for example, a plant found growing in a chalk down land may not thrive in a salt marsh! Our plants are from limestone meadows and we recommend they be used on reasonably free draining calcareous soils. Glaucous sedge is strongly reliant on seed for the colonisation of new sites and is a frequent pioneer of disturbed bare areas, however, once established regeneration is largely vegetative by means of rhizomes. 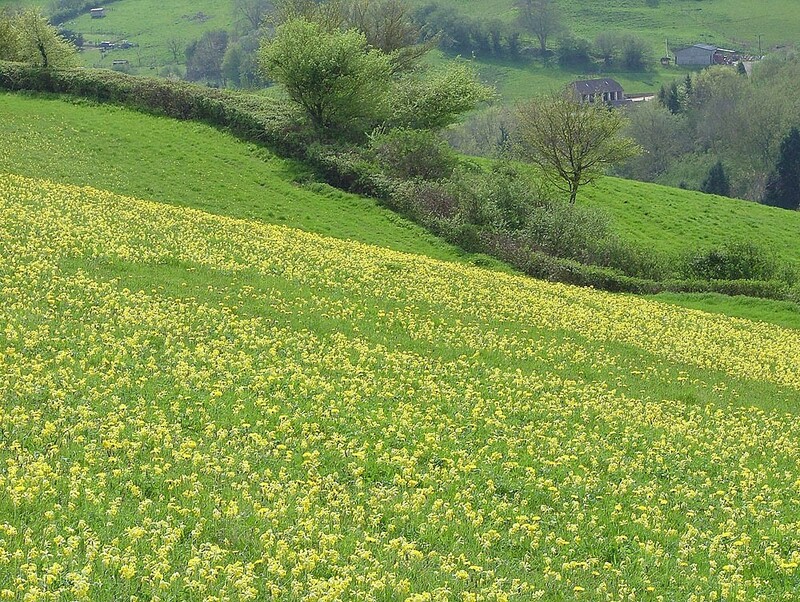 The photograph in the side bar on the right shows a green ring of glaucous sedge growing amongst cowslips on our farm near Bath. This was formed by a founding plant which became established in a gap in the sward decades ago. It produced rhizomes to form daughter plants which in turn did the same resulting in a circular patch of plants. Eventually the original founding plants die resulting in a slowly expanding ring. Seed is best sown in late summer or autumn. You can order any quantity of this species from 1g up to 250g. Please contact us if you require more.